I took these pictures during a visit to Black Mountain in the fall of 2010. Black Mountain is a beautiful mountain town. We stayed in the Madison Inn just outside of town. I asked the owner if there were a place where I could take some good sunrise pictures. She told me about a nearby old highway that had been converted into a hiking trail. She said that by parking where the road ends and walking about a mile, I would find a great overlook with a 20+ mile view. I hiked ther the next morning. The sunrise pictures are from that point. I took them over about a 20-30 minute period. While there, a hiker told me about the train tunnels nearby. 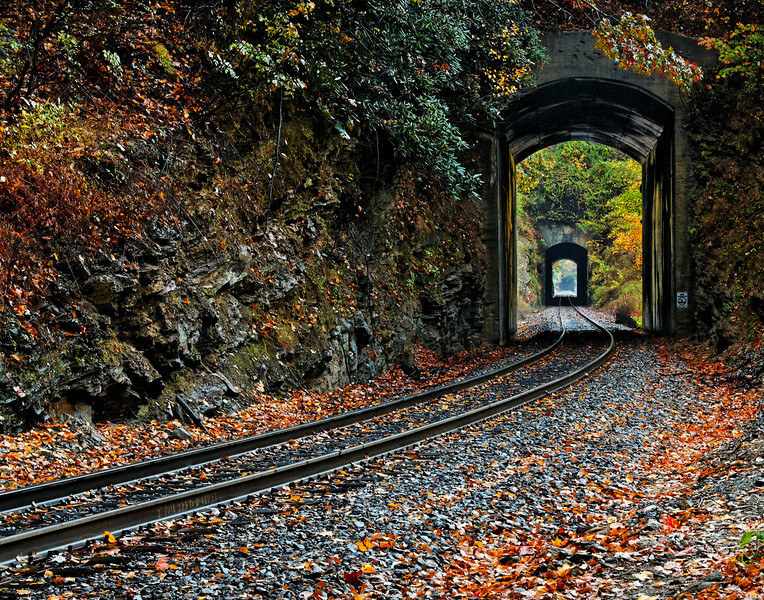 I hiked down the trail a little ways and then climbed up to the railroad track to take the picture of the tunnels. About 20 trains a day pass through this area. Hope you enjoy these pictures. I love the tunnel within a tunnel!